A new variant to New Zealand's most popular sparkling wine brand. Lindauer Fraise is an exciting innovation in the wine market - a méthode traditionnelle infused with natural strawberry essence. 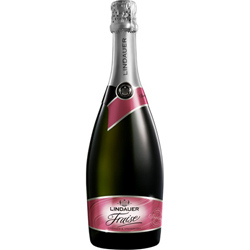 Lindauer Fraise has a hint of sweetness which complements the subtle, lingering taste of strawberries. A fantastic new way to add fun to any occasion. Variety: 50% Pinot Noir, 30% Chardonnay, 20% Chenin Blanc. This Strawberry wine is awesome, bought it for my kiwi girlfirend who loves it! Tastes even better with a strawberry in the bottom of the glass. Just try it!